Myda's ashes had been taken back to Bohol, Philippines upon the request of her mother. Husband Bong and children returned to the Philippines. On behalf of Bong Clarin and children, KASAGIP Charitable Trust would like to thank you all for your generous donations and offer of support, sympathy, presence and prayers during Mayda's sickness, the wake and the funeral. With your help, we are able to raise enough funds to completely pay off Mayda's funeral expenses with a little amount left to help Bong and kids with their pocket money should the family decide to return to the Philippines. Please continue to pray for Myda's soul, and that she finds eternal joy in heaven. For those who are wondering about the next steps, immediately we need to give Bong and kids a time to grieve and continue to pray for the family while we wait for news regarding the family's plans. Following the death of Myda Clarin, husband Bong sought the help of KASAGIP to continue raising funds enough to give the family some financial assistance for their transportation expenses. 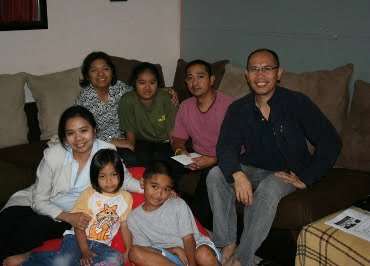 Through the community's generosity and KASAGIP's other fund raising strategies, the family has finally left New Zealand on 18th of April 2010, with enough pocket money as start up funds to rebuild their life in the Philippines. Bong still intends to return to New Zealand in the future but will aim to finish some courses leading to his preferred work as a skilled migrant. Provided is a photo of Bong taken a few days before their departure with some members of KASAGIP. In the photo are Bong Clarin (3rd person to the right) and kids, with KASAGIP members Rachel Pointon (seated with Lance), Mimi Laurilla (seated with Agnes) and Jarvis Laurilla (seated with Bong). Total Funds raised for the Clarin family amounted to $7,812.30 (prior to deductions for the funeral expenses, plane ticket and pocket money).